(…continued) It is no wonder that down through the ages one of the main items on the agenda for philosophy and religion has been this whole area of the relationship between the spirit and the flesh. Plato gave birth to the whole study of philosophy with the thought that you could think your way out of your body, transcending all the limits of the flesh by high and lofty thoughts. Buddha followed a similar path, adding a religious flavor to the whole thing. For Buddha, nirvana became a heaven in your mind, a mind lifted far above the concerns and needs of the weak flesh. However, I would still bet that when Plato or Buddha stubbed their toe real hard, it was back to thinking about the body and nothing else. Injuries and illnesses can turn the body into a prison. But in some religions and philosophies the body is nothing but a prison, and only the spirit matters. The Bible itself has much to say about this. For example, Galatians, 5:17 says, “The flesh desires what is contrary to the Spirit, and the Spirit desires what is contrary to the flesh; they are in conflict with each other, and so you end up not doing what you want to do.” This may even be one reason why people come to church. We want to be controlled less by our lower nature and desires, and more receptive to and motivated by our higher, spiritual nature. Oddly enough, this all has something to do with Christmas. In fact, it goes to the very heart of the Christmas message. After all, when John in his Gospel wanted to describe what it means that Jesus came to earth, he began by referring to Jesus as ‘the Word.’ He began his Gospel by saying ‘in the beginning was the Word, and the word was with God, and the word was God.’ That is some deep theology, expressing some highly spiritual concerns. When you think of God, you are thinking in primarily spiritual terms, right? John would agree, saying that God is a Spirit and Jesus was God in this mysterious, profound, spiritual Word, — that was there with God from the beginning, and was God. 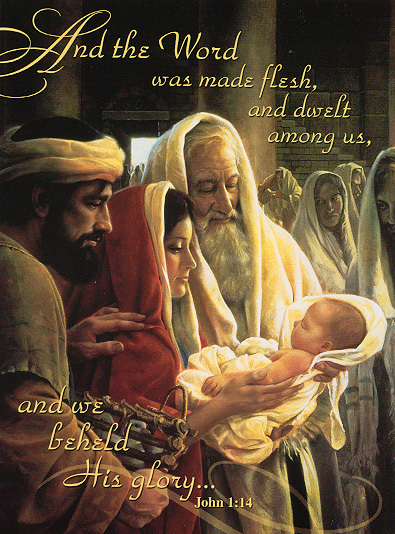 But then John goes on to say, “And the Word became flesh and dwelt among us.” Became flesh! Plato, Buddha, the New Agers, and the Scientologists all want to escape the flesh and get into something new and better and different. But God becomes flesh, born in the usual messy way, wrapped in swaddling clothes, and placed in a manger. God, while fully aware of all the problems and pains we get into because of our flesh, still likes the stuff. He created it, after all, and in Jesus, God himself took on that frail, frail flesh. And Jesus was tempted by that flesh; ‘Turn these stones into bread,’ the devil said to him when his body was hungry. But Jesus resisted all temptation and remained sinless. Jesus, however, did not escape that other curse upon flesh, the curse of pain and death. As you well know, he suffered and endured that to its fullest measure. God, in Jesus, sanctifies the flesh, makes holy the body, and proclaims the message that salvation is not attained by escaping the body, but in rising from the dead with a new and glorified body for all eternity. Plato and Buddha didn’t think of that, and if they had, they would not have been able to pull it off. But God could, and chose to do so by first of all, taking on this body, this flesh; and in then, in himself, suffering all that would involve. That is what it means to say that God was in that manger. God in human flesh. Then on the night before he died, and just a few weeks before he would return to his heavenly home, Jesus gave the disciples something to remember him by. It would be a specific ritual with specific words to say: “This is my Body, given for you– do this in remembrance of me…’’ And why? “For the forgiveness of sins,” he said. In this world our bodies will tempt us, torment us, and grieve us to no end. But the body is not the problem. This flesh is God’s good gift. Sin is the problem, and in looking to Jesus, we receive both the forgiveness of sins, and the resurrection of the body; a new, solid, and no longer frail body, perfected and eternal, made to live forever in God’s home. ’Tis a land where we’ll never grow old. John 1:1-5…14 — In the beginning was the Word, and the Word was with God, and the Word was God. He was with God in the beginning. Through him all things were made; without him nothing was made that has been made. In him was life, and that life was the light of all mankind. The light shines in the darkness, and the darkness has not overcome it…. The Word became flesh and made his dwelling among us. We have seen his glory, the glory of the one and only Son, who came from the Father, full of grace and truth. Galatians 5:13 — You… were called to be free. But do not use your freedom to indulge the flesh; rather, serve one another humbly in love. Galatians 5:16-17 — So I say, walk by the Spirit, and you will not gratify the desires of the flesh. For the flesh desires what is contrary to the Spirit, and the Spirit what is contrary to the flesh. They are in conflict with each other, so that you are not to do whatever you want. This entry was tagged christmas, Hymns. Bookmark the permalink.